I was recommended to see you by my friend Carmel as I saw her posts on FB 5 years ago. Before I came to see Chris I wasn’t able to do as much training as I wanted to, because I had a small child and I was a single parent working full time. Although I’ve always done some form of regular fitness since my late teens, I knew I wouldn’t have the time to go to the gym two or three times a week.. Spending an hour with Chris, meant I got a more intense workout and he pushed me harder than I’d push myself. Since I’ve been coming to see Chris, my strength has improved. I used to have really weak wrists, but now they don’t cause me any problems at all. During the last five years my fitness has improved massively as well – I no longer fear burpees! This year I set myself a number of cycling related goals, and I have reached all of them. The main one was to cycle from London to Paris, which I completed in less than 24 hours in April. 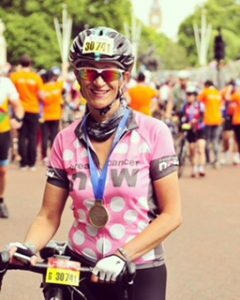 I also have cycled in a number of hundred mile events, including the London Ride 100, which I did for breast cancer now, and raised over £1000. Cycling seems to have taken over my life, and I have completed a number of cycling sportives. This year to date I have cycled over 4,500 km and over three times the height of Everest (28,000 metres). Chris has always provided excellent training and support and changed the workouts each time. Additionally, when I wanted to improve my strength for the cycling events I was taking part in, he adapted my workouts to suit and this helped my endurance, especially on the London to Paris event when I had no sleep and cycled 320km in total. At The end I was very tired, however the next day I felt absolutely fine, with no aches or pains. I would and have recommended Chris to a number of friends! He’s very flexible, and is happy for other people to join me when I workout, and it’s meant that my son has it been able to join me more recently as well.